I am originally from Germany, and specifically from Southern Germany and a city called “Konstanz” which is somewhat close to “Stuttgart” but really closer to Zurich, Switzerland. How long have you been living in the United States and what brought you here? I came to the US in 1997 so I have been here 16 years. I came here to complete my college degree on a 1 year exchange program with my German University and then fell in love with the country, the people, and last but certainly not least at all, met a girl who now is my wife of 12 years. How did you get your visa and green card? In the college in Illinois, there were 11 Germans during that year, and virtually ALL wanted to stay in the US and get a job. I ended up being the only one who actually did get a job here right out of college. Only one other German, managed to come back to the US after a couple of years in Germany, through an internship with Coca Cola. In my case I had had experience as a Student worker in a Software company, working my way up from just doing software testing to later on being a full member of an implementation and training team and working more and more and even full-time at that company – while attending college full-time too. That gave me the chance to be hired by a similar competitor company in the US, Siebel Systems, Inc, (now part of Oracle, Inc) for the practical training year that every international college student has the right for after 1 year of college in the US. During the interview they however already indicated that they were willing to sponsor my Green Card, which they did. It took 5.5 years to get the Green Card, and it is quite an ordeal. Not only did they have to prove that I was not taking away a job from an American, but I also had to prove to the US Immigration office that I had certain requirements, years of experience, and most importantly letters of recommendation proving my experience. That last part was the hardest and got my application stalled for over 6 months because the attorneys “assumed” I did not have that, yet did not reach out to me to ask for that. And getting them was not easy because that company in Germany had since been bought up by another company (SAP) and now I had to track down my former managers there. Luckily thanks to the power of the internet I was able to find them and had them write up reviews, and recommendations that fulfilled that requirement. The last holdup was the salary. According to the rules the applicant needs to be making at least I think 90% or 95% of the average income in the position they are. Apparently, I was slightly underpaid (one of the things that can happen when you can’t leave to another company and are their “modern slave” ) and had to ask for a raise in the middle of the 2001/2002 Dot.com Bubble Burst Recession and while the company I was working for was letting go of thousands of employees. Not a good time to do that. Yet in spite of this, and in spite of the request having to go in front of the Senior VP of the entire multi thousand people company for whatever reason it was granted, and so in May 2002 I was able to get my US Green Card. 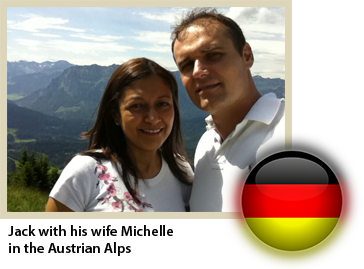 In Germany before leaving I would have asked for more reviews and more recommendations upfront so I would not have had to look for these people forever and convince them – 5 years after having left that company in Germany – to write me recommendations. Luckily, I must have left a good impression so they were willing to do that. If they had not, I would have not gotten my Green Card. What do you enjoy most about living in America? The lack of red tape to start your own business (an LLC and a bank account is enough and you are in business – and that takes, depending in which state you are, between $100 and $800 and a few minutes completing a form – AMAZING). The comfort of day-to-day life. Everything is designed for the customer. Not much, other than my landscape, the architecture… and the food. If anything I miss that even smaller cities in Europe have a vibrant inner city life, a down town where things are happening. A city of 200,000 people has often 20 acting theaters and even an opera that plays 100 nights a year, while in the US a city with 4 million people has trouble filing an opera for more than 15 shows a year and an acting theater for more than 50 shows a year. I love cultural events like that and you just have to live in one of the 3 MAIN cities of the U.S. (NYC, Chicago, L.A.) or one of the cities known for their creativity like San Francisco to really get the most out of that part of life. I live in Phoenix, AZ and at least it is one of the 6 largest cities in the U.S., so while having to look for these kinds of things there is a lot being offered. The vast majority of internationals who mingled together, went out together, had BBQs together every weekend and basically stayed in their own circle. Now imagine going to a weekly party where people from Indonesia, China, Chile, Germany,… are hanging out together speaking English to each other. While from an inter-cultural point of view these parties were one of the most enriching things I have ever encountered and I got to learn so much about other cultures, it’s the worst thing to do for your English. Speaking bad English with other people who’s English is also bad, does not improve your English. The Second group of people, the minority, and which I consciously joined is the group of people who make friends with the locals, join a local job, a group, or band, or even a fraternity, and spend as much time as possible amongst the English speaking locals. In my case I followed the second group in that I made friends with 2 Americans who liked to go out, and I do too . So I spent hours every weekend (at least) and at least one evening a week speaking English, listening to them speak and adopting the common phrases used by Americans. While of course still spending some time with the other Germans and the international community, I made sure that it was not the majority of time spent. In addition I watched a lot of TV. Not just brainless TV, but for the purpose of, again, learning the language. I watched a lot of Baseball to learn the rules, immerse myself into the American sports culture and also watched shows like Seinfeld, which are very conversational, so I could listen to conversations and learn from them. And the best move I made was to get a job at the university student union office, where I was just around Americans for about 5 hours a DAY!!! I had to read, write, speak on the phone and be in meetings expressing myself all in English, every day. Those moves gave me probably the biggest boost and that is what I would do again. You’ve built a very successful business from scratch. Please share your story with our readers. I would have to give up the close contact to my family (I am the only one over here in the U.S., the rest of my family, brother, parents, cousins and friends are all in Europe), because there is not enough time to go visit them often. Or if they come visit, I would not be able to take time off. I would not make enough money to live the lifestyle I wanted while keeping family close and getting to know my new country, the USA. Plus after 1-2 years I didn’t like my job anymore, yet I was locked into it until I got my green card and I feared that after a total of 8 years (5 in the US and 3 in Germany) in the same industry I could not make the jump into another industry anymore. I would be stuck for life in an industry I really didn’t like that much – software consulting. In my core I was a business guy, a marketing guy and an idea guy. So after a lot of research I came across real estate investing and in particular the flipping of land parcels the owners no longer want and which I could pick up in many cases for 5-25% of market value and then flip in a matter of a few days or weeks for 2-5 times or even sometimes 10 times of what I bought them for. One deal could make me as much as my monthly salary was at my job and often more than that. So after testing and figuring things out while I had my job, I then created a Real Estate Investment system that works very reliably to this day and will for many decades to come. And then we (my wife and I) got going, all part-time while having a job. Once I had my green card and once I had paid off my student debt, my consumer debt and put a bunch of money to the side, I quit my job and dove full-time into Real Estate Investing. And since then I have flipped over 3,000 pieces of land. Since 2008 I have been teaching my technique to the public at www.LandProfitGenerator.com and www.UltimateLandLottery.com. You teach people how to make money in real estate. What is your best-selling course? I don’t know if it matters what the best SELLING course is, but the course my students have most success with are the courses mentioned above, both of which cover the same subject. UltimateLandLottery.com is the basic introductory $97 course. LandProfitGenerator.com is my flagship comprehensive course for $997. With this technique and a little dedication most people who apply themselves are successful. 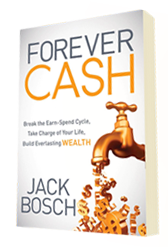 Your newest publication is the book “Forever Cash”. Tell us a little bit about it. After having done a bunch of land flips we realized that flipping land is GREAT and creates a lot of cash, but if we ever want to retire we have to convert what we call “one time cash”, meaning cash that only comes in once after we do a deal (we get paid), into what we call “forever cash”, which is cash that is residual and comes in again and again forever without having to work for. And then I realized that most people just “earn to spend” and if they earn more, they spend more only to live in an even bigger hamster wheel of life and being actually farther away from being able to retire than before. Just as the Aristocrats that live in Europe in their big castles and don’t actually work, because they live off of their Forever Cash investments that, once created/placed, create more income than they need to live on. We can create a world like that too, if we focus on creating “everlasting Passive Cash Flow” instead of focusing on how to create a large “Money Mountain” aka “the amount needed to retire”. A big pile of money can disappear fast with a stock market crash, or by squandering it, or by giving it to an advisor like “Bernard Madoff”. But cash invested in a variety of different places each of which brings in monthly, quarterly or annual cash flow, keeps you save from crashes (actually the value of the investments doesn’t matter as long as they spit out the same cash every month) and creates financial independence and stability forever. So we realized that we need to continue making money in Land Flipping, but now use that part of our business as the CASH Generator for investments in assets, that will bring cash flow forever in ever larger numbers. And once we implemented that for just 1 year, we were and are “Forever Cash” financially independent. It is my belief that within 3–5 years anyone and everyone who puts his/her mind to it, can be financially independent from a job forever. And within a few more years anyone can be rich, wealthy, and live the good life forever.